The Mountain Express newspaper (Asheville, NC) covered our team’s upcoming journey to Copenhagen to use C-ROADS and the Climate Interactive Scoreboard to make a difference in the global climate deal. Writer Margaret Williams covered our work and the youth leader Ellie Johnston’s too. Climate geeks unite! Asheville resident Drew Jones — who admits he’s a bit of a geek — has helped develop a climate-simulation tool that’s already being used by some of the behind-the-scenes negotiators for the upcoming conference in Denmark. This December, world leaders will convene in Copenhagen, Denmark, to continue what they started with the Kyoto Protocol in 1997: fleshing out the framework for an international agreement aimed at combating climate change. Several Asheville residents will be there, reporting what happens, providing technical expertise and trying to convince world leaders to make strong commitments to reducing greenhouse-gas emissions and slowing global warming before we reach the point of irreversible environmental damage. UNC-Asheville junior Ellie Johnston is one of 25 “agents of change” who will represent the youth movement SUSTAIN US in Copenhagen. These young Americans, ages 19-26, will be joining other youth from around the world. She’ll be blogging about the day-to-day happenings and joining demonstrations. 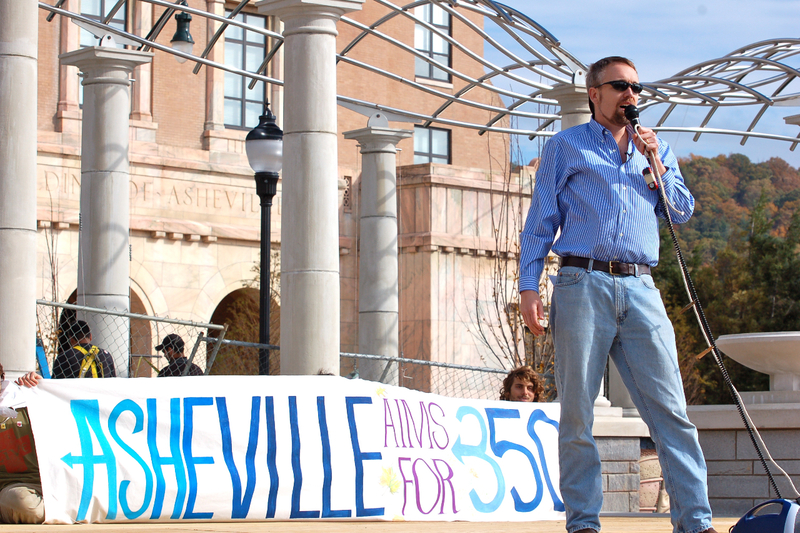 Asheville-based climate expert Drew Jones will also be there, working behind the scenes to help negotiators see the big picture via computer-modeling tools, including a “climate scoreboard” that will show how various actions — setting and reaching emission targets, for instance — would affect global temperatures and carbon-dioxide levels. “If we do nothing, global temperatures could rise 4.5 degrees Celsius higher than pre-industrial levels. That’s a world we can’t adapt to,” says Jones, program director for the Sustainability Institute. A commonly accepted target is limiting the temperature increase to 2 C, and it’s already up 0.75, he explains. Another goal scientists are pushing for is 350 parts per million of carbon dioxide in the atmosphere — a level we’ve already exceeded. Nonetheless, the SUSTAIN US contingent will use social media to spread the word about the negotiations as they unfold in Copenhagen. “We’ll react to developments there, taking pictures and writing blogs and communicating what’s going on via Twitter and Facebook,” says Johnston. The group will also do some old-fashioned demonstrating, making and holding up banners urging world leaders to take action on climate issues. The commitments made — or the opportunities missed — in Copenhagen “will have effects that will be perpetuated onto my generation and the generations after me,” says Johnston, who co-chairs UNCA’s Active Students for a Healthy Environment and founded the North Carolina Youth Climate Coalition. “What happened in Kyoto, in part, was that everyone used their own numbers, and the numbers didn’t add up to anything,” says Jones. The commitments to carbon-dioxide limits made then were weak, he argues. The U.S. didn’t sign the Kyoto Protocol and to date hasn’t made any emission commitments. We’re far from dealing effectively with climate-change issues, he argues. Jones sees the climate scoreboard as a unique way to pressure American legislators to get in the game and adopt our own targets for reduced emissions. What makes this year’s conference especially relevant to Asheville is the convergence here of the scientific community — the National Climatic Data Center is headquartered in town — and the media artists “who know how to take data and make it beautiful.” In developing the widget, the Institute partnered with a local designer, and much of the work on the underlying simulation tool has been done here too, Jones mentions. “That’s so Asheville!” he says. For more information about C-ROADS and the Sustainability Institute’s work, go to sustainer.org. For more information about the Agents of Change, visit sustainus.org. For news about the COP15 or Copenhagen conference, go to en.cop15.dk/. You can help Johnston fund her trip by clicking on the donation box on the right-hand side of the SUSTAIN US home page. Margaret Williams can be reached at mvwilliams@mountainx.com or at 251-1333, ext. 152.